Oil change and filter replacement is one of many preventative maintenance services that help your vehicle perform at optimal levels and can extend its life. Oil’s function is to lubricate components inside your vehicle’s engine, reduce the amount of friction between them, act as a cooling agent, and redirect harmful particles into the oil filter. During an oil change, the experts at Four County Import Service will replace your engine’s old oil with new oil and replace the oil filter. We will also lubricate the chassis components of the vehicle according to the standards of the manufacturer. At the end of every lube, oil and filter change, our technicians will have ensured that your engine oil is clean and the working parts of your engine are properly lubricated. Routine lube and oil changes will keep your engine running stronger and running longer. Contact today about your next lube, oil, and filter change. 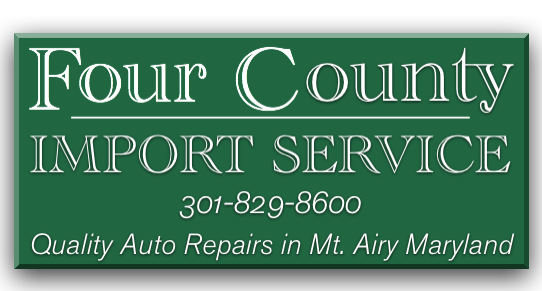 Four County Import Center Mount Airy, MD and surrounding areas in Montgomery County, Howard Count, Frederick County, and Carroll County with quality oil changes and lube service for all makes and models of vehicles. Give us a call at 301-829-8600 or stop in today!